The Joint Arab List will not recommend Labor leader Yitzhak Herzog for prime minister - at least according to Balad MK Hanin Zoabi. Speaking on Channel Two's Meet the Press, Zoabi explained why her party torpedoed a possible surplus agreement with the left-wing Meretz party and why the joint list prefers to remain in the opposition. Meretz and the Zionist Camp of Labor-Hatnua had agreed to a surplus vote agreement weeks ago, but in an effort to strengthen the left-bloc, they wished to include Yesh Atid and the Joint Arab List by pairing Yesh Atid with the Zionist Camp and Meretz with the Joint Arab List. According to reports, while Hadash and the United Arab List agreed to the move, Balad squashed the deal, and Meretz and the Zionist Camp maintained their original agreement. Zoabi states, however, that this is not true and a majority of the Joint Arab List was opposed to the surplus deal. "We, as a strong and influential bloc of the oppressed and the Arab inhabitants, do not want to be enslaved to the violent Right or the center that is both arrogant and racist," she argued, viewing both Labor and Meretz as center, rather than Left. Addressing coalition building, and the Joint Arab List's plans, Zoabi stated outright that the party would not recommend Herzog - something analysts have been speculating on. "Of course, we will not recommend Herzog, and certainly not [Prime Minister Binyamin] Netanyahu. We want to bring down Netanyahu because of the criminal war he conducted on my people. We also want to weaken the Right and the racist, belligerent, and arrogant center working at the hands of the Left bloc." "Herzog and Labor are the architects of the settlements and the confiscation of land," she continued, "and we remember what the Labor party did in October 2000. The center bloc went Right and distanced itself from the real Left, and didn't even call itself Left." 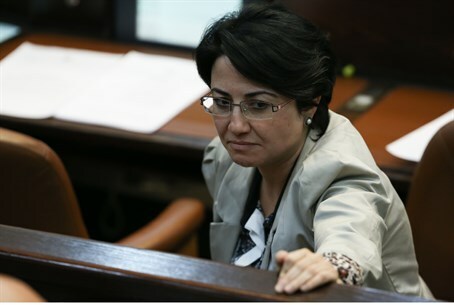 Arguing that the Knesset has no real Left, Zoabi stated that she wanted to build that Left. Addressing the fact that she was almost barred from running in elections because of support for terrorism, Zoabi said furiously that "No one will tell me how to run for the Knesset and on what political platform. I have a place as a Palestinian citizen."